What Makes a One-Sheet A “Must-Have” Marketing Tool? These questions become your opening to convey how you assist people and why you’re the one experienced to do so. That’s exactly what a marketing one-sheet does, too. To convey that you’re a “must-have” expert, your one-sheet needs to be written and designed effectively. 1. How would you describe your area of expertise? 2. Whom do you work with and give presentations to? • for the leaders of the organization? • for the participants in the ranks? 4. What have you done that makes you an expert? 5. Which groups have you worked with before? 6. What did participants think of your contribution? 7. How can you be reached for more information? Even if you have all of these elements in place, what turns it into a stronger “must-have” piece that represents you? In a word: Personality. 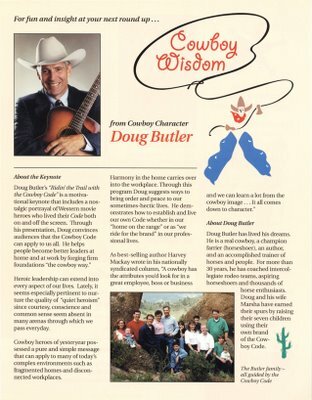 • 4-color photos of Doug portraying his Cowboy Wisdom theme. • Graphics of cowboy symbols: a guitar, a horse, a lasso, a badge, a cowboy figure wearing a hat, bandana, and chaps—even a spurred cowboy boot. 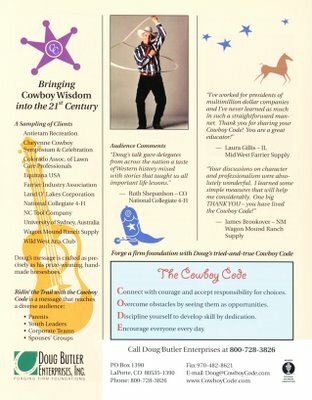 • Cowboy Code message that stands out on the page. • Benefits in the headlines: e.g., Bringing cowboy wisdom into the 21st century. • Bio framed by a color photo that adds credibility for his message. • List of target audiences, a sampling of clients, and comments from them. • Well-designed company logo and easy-to-find contact info. • NSA logo to show affiliation with a group recognized by decision-makers. Through these words, themes, and graphics, Doug extends his warm personality to additional marketing pieces—his website, business card, handout materials, and so on. Together, they create a “must-have” look that appeals to decision-makers in organizations he wants to reach. Do you need help designing and writing a one-sheet for your speaking or consulting business? You want your one-sheet to convey your services and talents with maximum appeal. How do you accomplish that in a single page or two? Writer/editor Barbara McNichol and I will share our techniques so you can better craft a one-sheet that gets you noticed. This includes a 15-page full-color handout packed with tips and graphic samples. To order the CD or MP3 from this teleseminar, click on this link: http://tinyurl.com/zj2zy or copy and paste it into your browser window address field.